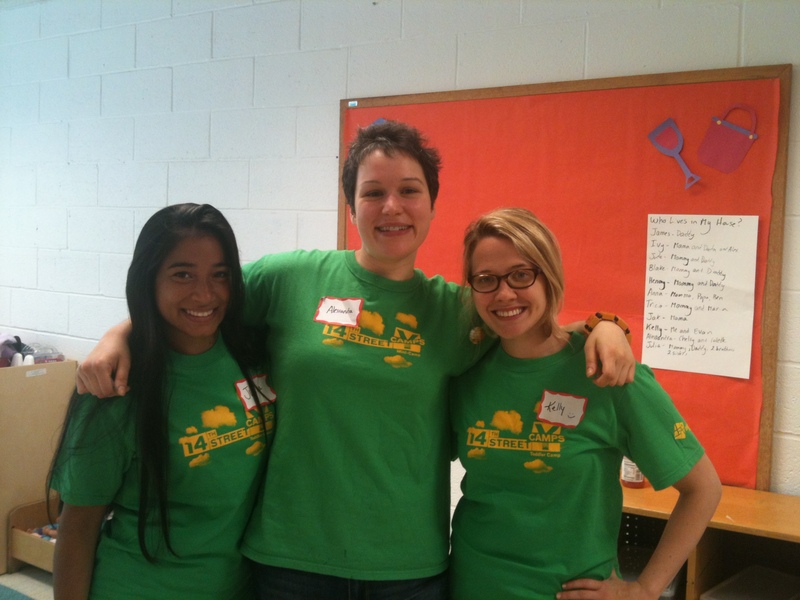 It’s the first week of Summer Camp at the 14th Street Y! At the Y, we’re very proud of our three award winning camps. 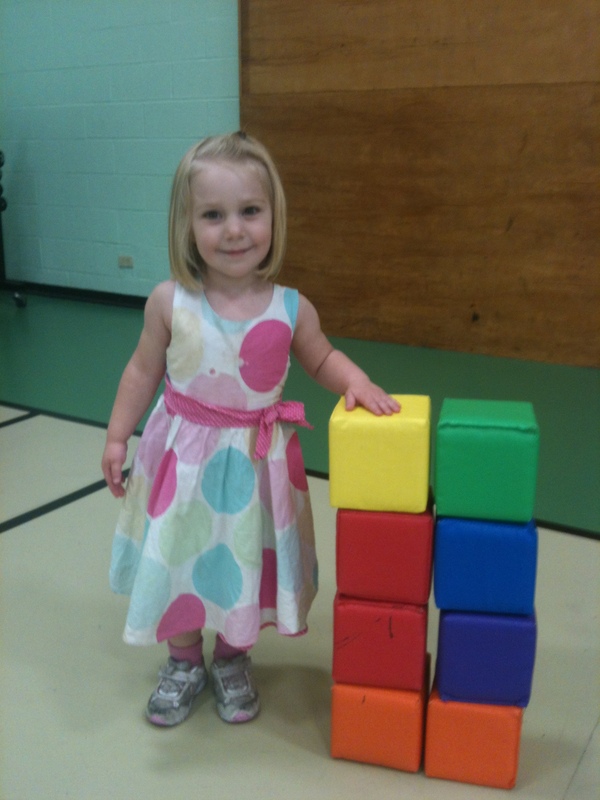 Our Toddler camps began on Monday, and it’s already been an amazing week. On Thursday, both New Town Day Camp (ages 3.5-5) and New Country Day Camp (K-8th grade) begin. All of our camps fill summer days with sun, water play, new friends, activity and memories that last a lifetime- from the first class without a caregiver to the first ride to big kid camp on bus. We can’t wait to hear more about it, and we’ll be sharing their stories here! Our Rooftop Playground is more fun than ever. 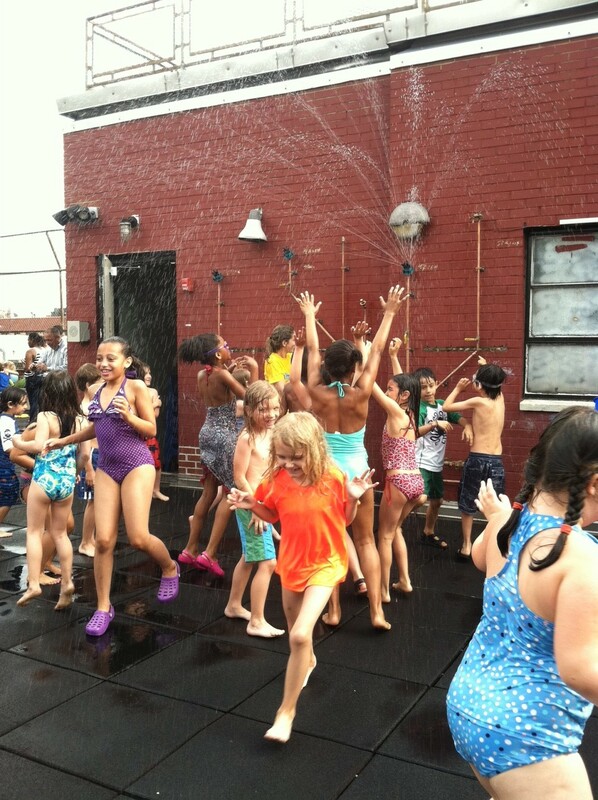 Look at our amazing afterschool kids having a blast with the new water play system. They were the first to try it. It’s kid tested AND approved! The scaffolding outside our building will stay up while we add rooftop planters, seating, and a beautiful shade structure just in time for summer camp and Summer Rooftop Yoga (Monday and Wednesday evenings starting in July)! This week our Parenting, Family and Early Childhood center is hosting OPEN PLAYTIME in our basketball gym. Everyday at 9:15AM, kids who need something to do in those weeks between preschool and camp can be found running, jumping, throwing balls, crawling through hoops and building castles just like this one! OPEN PLAYTIME ends this Friday, June 22nd. Hope to see you there! Thanks, KNICKS, for hosting our Basketball clinic on 6/6! Look at all these happy kids, and hey…is that KNICKS legend John Starks in the back? All proceeds went towards our gym floor! Thanks so much to all who participated! All shows feature our insanely fun Txt2Thtr technology, so bring your cell phone and be part of the show! (Seriously, this whole endeavor is about opening up the process to you, the viewer, so you can tell us where we have it right, and where we need to keep looking. These 50 artists have something they want to say, and you can help them say it in a way that is powerful and contemporary and awesome.) So, without further ado, here’s Project Coordinator Arielle Parkas’s first resident artist interview with Zohar Tirosh-Polk. Zohar, your play SIX was the winner of the 2012 JCC Metrowest Jewish Playwriting Contest, the prize of which was getting to take part in the OPEN Residency. Can you tell me what it was like on the final night of the contest? We didn’t know what we were getting into! Of course Six had some rehearsal time but not all the rehearsal time we would want in the world to do this thing right and so everyone was excited and nervous. But the actors just succeeded in doing an amazing job and I think that the three plays ended up talking to each other in surprising and fascinating ways. It turned out to be a really rich and well thought out evening of theater and the cherry on the top was that Six won which was unexpected and so wonderful. Well we are all so excited that you did because it means we get a chance to see more of SIX! Part of the mission of the Jewish Plays Project is to advocate for plays that embrace and investigate the intersection of Jewish identity and the secular self. How does SIX fit into that mission? Six both embraces and investigates our relationship with Israel, and those intersections where Israel is both a contemporary place and a holy land, and a historical and political place as well as a home. Six is about the beauty and complexity and the allure and the difficulties of Israel right now and relating to Israel from the American perspective as well as from the Israeli perspective. For me at least, my relationship with Israel is an ongoing process and it encompasses a deep deep love and many other complex feelings that involve guilt and longing and shame and a profound connection. I can’t wait to see how you further continue to investigate these themes during the residency. What are you most excited for about that upcoming process? I am most excited to be working with such an amazing team of incredibly talented people! Ian, the director, has worked with me on Six from its first draft. We are really looking forward to a more fully staged and embodied version of the play moving towards a production – it is a very exciting moment for us as collaborators. Ron Guttman is an amazing actor and producer who has also been working on the play since that first reading. Ron, along with some of the other actors, were part of the team that helped Six to win the JCC Contest. Hani Fursteberg, who is been in many many Israeli TV shows and plays and films will also be joining us. It’s going to be like a big love fest reunion! When an ex-pat Israeli returns home with her American boyfriend, they are both changed by the echoes of the past and the beauty and spirit of the present. Intertwining stories highlight connections between the complexity of Modern Israel and the fight for peace at the end of the 1967 war. Previous readings were held at The New Group, Cape Cod Theatre Project and San Francisco’s Magic Theatre. OPEN is generously supported by a grant from the UJA-NY Federation Commision on Jewish Identity and Renewal’s Gen i Task Force, the Louis T. Roth Foundation, and private donors. The Jewish Plays Project is grateful for the partnership of JCC Metrowest (Alan Feldman, Executive Director, Carol Berman, Director of Arts) and the PresenTense Group. ABOUT LABA: LABA is a Jewish house of study for culture-makers located at the 14th Street Y. 10 fellows — a mix of artists, writers, dancers, musicians, actors, and others — partake in a yearlong study of classical Jewish texts centered around a theme, and then interpret these texts in their work.